Raising our vibrational frequency paves the way to releasing negative energies based upon fear and anger, while promoting positive energies of Light, Love, Joy and Compassion. Raising Frequency is the key to Raising Consciousness, which in turn promotes a deep connection with our Inner Self, or True Essence. This deep connection offers a portal to new understanding about ourselves, and how we interact with the world… put simply, it allows the Awakening of our Full and Infinite Potential, and helps unlock our powerful, innate self-healing capabilities. Raising Frequency promotes positive feelings and emotions of Oneness, Peace, Joy and Harmony, while decreasing the negative vibrations of anxiety, fear and isolation. Raising Frequency promotes positive feelings and emotions of Oneness, Peace, Joy and Harmony, while decreasing the negative vibrations of anxiety, fear and isolation. This enhanced emotional wellbeing and spiritual enlightenment creates a positive impact on all aspects of our lives, including physical wellness. 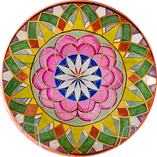 Support The Art of Raising Frequency with a beautiful Healing Disc. The Art of Raising Frequency invites us to enhance and leverage the subtle energies that constantly surround us, and offers an opportunity to create an energetic environment that is supportive, loving, peaceful, insightful and inspirational. The Art of Raising Frequency presents beautiful and highly beneficial frequencies which raise our Consciousness, assisting us to awaken to new possibilities and potential. The Art of Raising Frequency inspires new ways of living and being within the world which are founded in LOVE and the HEART. The Art of Raising Frequency creates an energy shift within the subtle energies, which speaks directly to our heart and soul, and is beneficial to all levels of body, mind and spirit. The Art of Raising Frequency enhances the energetic frequency of any environment such as home, school, workplace and healthcare organization. The Art of Raising Frequency is a new energy healing modality, based upon high vibrational art, crystals and sound. Particularly important are Barbara’s unique high vibrational Image Key ™ paintings, which she was guided to create for raising our personal frequency, and also the frequency of any space in which the images are placed … ultimately the whole environment. Barbara’s stunning art captures beneficial energies from the Higher Dimensions, translating and transmitting them into visible, tangible forms that encourage a powerful energetic transformation. Through raising the vibrational frequency of any space in which they are placed, The Image Keys invite us to raise our Consciousness, promoting Insight, Love and Wisdom… the building blocks to unlocking our Infinite Potential. They assist us to manifest our Highest Dreams, create the future we desire, and help anchor Oneness, Joy and Abundance into our lives. Color, Crystals, Sacred Geometry and Sound, the Language of Light and channeled messages are all interwoven in the Image Keys, creating a unique interactive living energy that is far greater than the sum of its parts. As a result, The Art of Raising Frequency is Alchemy in action. The energetic benefits of The Art of Raising Frequency are transformational, and can be thought of as a sequence. It starts with Raising Frequency and an associated Activation of our DNA Blueprint to new levels. This, in turn, stimulates raised Consciousness and an unlocking of the limitless possibilities (= Our Full and True Potential) that result from a deepened connection with our inner essence (“true self”), and with the Universe.